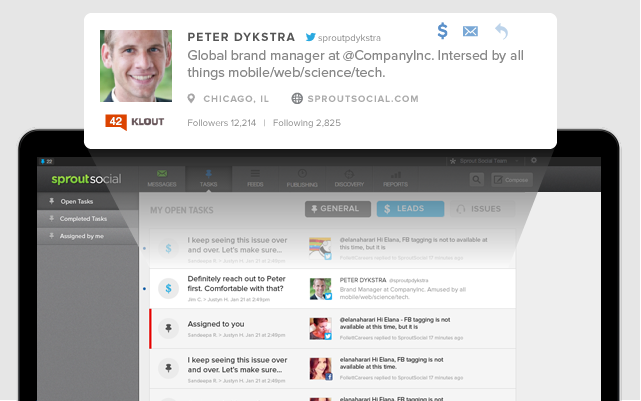 Task assignments in Sprout have always been a great way to distribute actionable social messages to your team. We love hearing stories about teams using social to route inbound inquiries and chatter from the outside world into the organization – whether it be to solve a customer issue, make a sale, or to turn a casual customer into a lifetime supporter. Today, we’re introducing some enhancements to Tasks that will give your team context around social and help get messages into the right hands as quickly as possible. The next time you assign a task in Sprout, you’ll have the ability to identify a task in three ways: as a Sales Lead, a Support Issue or a General Task. Have you ever found a prospect on a social channel with whom you want to stay in contact? You can now assign and collect social contacts when sales opportunities present themselves online, which we know happens quite a bit! Assign and track these leads to open a powerful new channel. Look for the new $ symbol on Twitter profiles and start creating leads! People used to pick up the phone for customer service and technical support, but it’s now just as common for them to seek help on social channels—that’s exactly why we made a task category for ‘Support Issues’. Zendesk and UserVoice customers currently taking advantage of our Helpdesk integration are familiar with this workflow; however, this task category will now enable all Sprout customers to get a feel for customer service tools within the engagement suite, without ever having to use another system. Mark Priority – You may now mark a task ‘high priority.’ A red bar will indicate items that need a higher level of attention. Interface update – We updated the Tasks worklist interface to make it even easier for you to get through your tasks and get on with your day. You’ll now have a clear summary for each task at-a-glance and you can now mark messages complete with a single click. We hope you enjoy the new features for Tasks! As always, feel free to reach out and let us know what you think about this enhancement or any other Sprout feature.